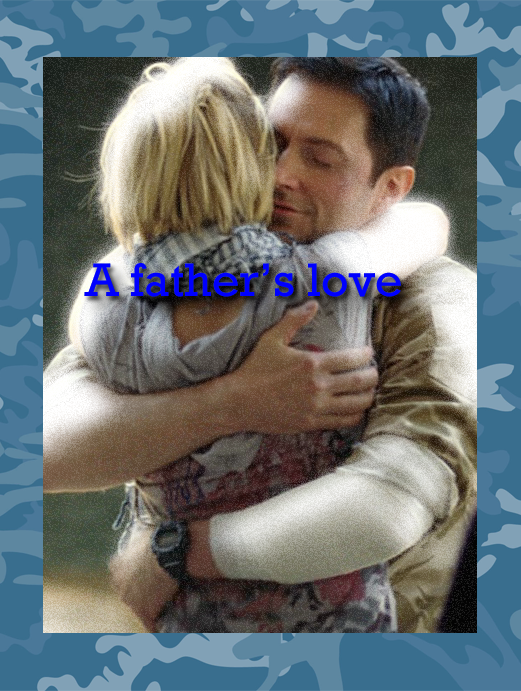 We’ve seen Richard Armitage play a dad in a few productions–Shakespeare Retold, Between the Sheets, The Impressionists and Strike Back (and stepdad in Sparkhouse) and just as he strikes all the right notes as ardent lover and romantic hero, RA makes us believe in him as a loving, caring father. I love this particular scene from Strike Back in which Porter, missing and presumed dead, appears on the doorstep to be greeted by his daughter and wife. The embrace he gives Alex, so all encompassing, the expression on his face–showing his pleasure is being able to hold his beloved daughter once more–positively tugs at the heartstrings. Part of Porter’s immense appeal is his tender side–the part of him that is so gentle with a traumatized Katie, the part that can’t reject the opportunity to aid orphans, the part that seeks to comfort his tearful little girl and later, to give her that wonderful “I’m glad to be home” hug. He’s big, tough and ruthless when need be; but he is also a kind and gentle man. He’s been estranged from his daughter after his life fell to pieces following the debacle of the Bratton extraction, but we know he never stopped loving or wanting to be with her. What a coincidence ! I’ve just re-wachted the first episode of Strike Back this afternoon. Sure he is a very moving tender father but in this chaRActer I think he is the quintessence of pure masculine beauty. I know it’s not the place to swear but “b… de m….” why are you so addictive and irresistible ????? The French speakers will understand. But don’t worry Guy you always are the first in my mind !!!! I have thought the same thing–that marriage, that fatherhood are not life choices he would take lightly or enter into if he didn’t feel truly ready and prepared to be a good husband and dad. Yes, and that’s probably why it hasn’t happened yet. But hey,he has time. I just hope he’ll find his “Deborra” (I watched a talk show with Hugh Jackman and his wife Deborra and you can see the guy absolutely worships the ground his lady walks on…) soon! And Hugh and Deborah do seem really happy together. He reminds me of Richard in terms of being multi-talented–acting, singing and dancing–and still a very down-to-earth guy who doesn’t take himself too seriously. Now if those two ever get divorced, I’d be really, really shocked and yes, even sad! Hugh seems to be a lovely guy and Deb is a truly formidable woman with a great sense of humour. I can’t believe how nasty some people are to Deb on the internet (if you google her name the suggestions that come up… ugh!) saying things like she’s not good enough for him, just because she’s not a stick insect and is some years older than him! What a distorted view of beauty some people have. As if nothing else mattered but someone’s appearance and age! I respect Hugh for not feeling as if he had to marry some nymphette supermodel to satisfy some people’s shallow expectations. And Deb for maintaining a sense of humor and dignity through it all. People can be incredibly cruel at times, especially when hiding behind a cloak of anonymity. Judit & angie, I agree with you. He has said he wants to get married and have a family, and I pray that it happens for him. I bet the little boy adores him too… I’m sure they have a lot of fun when they get together. Though his nephew can’t have seen much of him in the past two years or so. I think they spent more time together when the child was younger (not sure of his age). Imagine being a little boy whose uncle was Guy of Gisborne! How cool is that?